Every now and then, we writers like to take a minute to tell you what it’s like to do what we do. ‘Cause it ain’t no small thing, lemme tell ya. I was tagged by the fabulous Laurie Tomlinson to participate in a series of questions about life as a writer. I’m anxiously awaiting feedback from my fabulous critique partners on a completed (and revised and revised again) mystery. In the meantime, the next one, book two in a three-book series, is begging to be written. It will continue the journey of the main character introduced in book one. Well, I didn’t intend for my books to be humorous, but the funny just came out as I was writing. Who knew I had that in me? So although there’s murder, the style of my books is funny and quirky. I write what I want to read, essentially. I love mysteries and I adore a solid sense of humor. Think of it like Gilmore Girls meets Agatha Christie. Snark, wit, and murder. I grew up reading mysteries. I couldn’t get enough of the intrigue and the suspense and the whodunit. It took me a while to be bold enough to attempt a true murder mystery, but there was never any doubt mystery was my preferred genre. I love the way it pulls the reader into the action, the way clues have to be woven throughout with subtlety and nuance. It’s a challenge to write, for sure, but I think that’s part of why I love it. For me, it all starts with creating a character. (In the case of my current series, that’s a quirky, clumsy but smart executive assistant who finds herself miles beyond her normal world.) Once I’ve gotten to know my character, I brainstorm concepts, plot points, and the overall story arc but I don’t know all the details until I start writing it, until I’m in the middle of a scene and oh hello, here’s a great idea. I think of my writing process like a road trip. I know my final destination. I’ve got a list of places I want to stop along the way. But if I see a sign for “The World’s Best Coffee,” you better believe I’m taking that turn, list or no list! When I’m writing, I have an idea of where I’m going but I give myself freedom to explore other paths as they arise. I’m also a majorly visual person, so as I’m writing, I keep track of what happens in each chapter by scribbling the main points on notecards that I pin on a cork board in my office. That way, I don’t lose track of the big picture and I can easily find a specific scene. I also pin the names of characters as I introduce them so I know exactly when they entered my story (and so I don’t forget about them). And I keep a “suspects” and “victims” list. Because, ya know, I gotta know who I’ve killed and who I should frame for it. Gabrielle Meyer lives in Minnesota on the banks of the Mississippi River with her husband and four young children. As an employee of the Minnesota Historical Society for ten years, and the Morrison County Historical Society for two years, she fell in love with the rich history of her state and enjoys writing fictional stories inspired by actual people and events. She can be found on her blog, where she writes about her passion for history, Minnesota, and her faith. I want to tell you a story I first learned as a kid, one of the most important stories I’ve ever learned. It’s a true story about a woman named Elizabeth. Elizabeth was one of 9 children, the third-born of the family. (How good does your family look right now, huh?) After spending the first part of her childhood in England, her family moved to the United States. Not long later, they ran into major financial problems. Eventually Elizabeth started teaching in order to make money but she struggled to find her place. Teaching wasn’t exactly her dream. As if that wasn’t enough to deal with, a friend of hers was dying and told Elizabeth she wished she’d had a better doctor. Elizabeth thought, I could do that. I could be that better doctor she should’ve had. And so after studying with multiple physicians, she got into medical school and graduated. If that were the whole story, it would seem unremarkable. 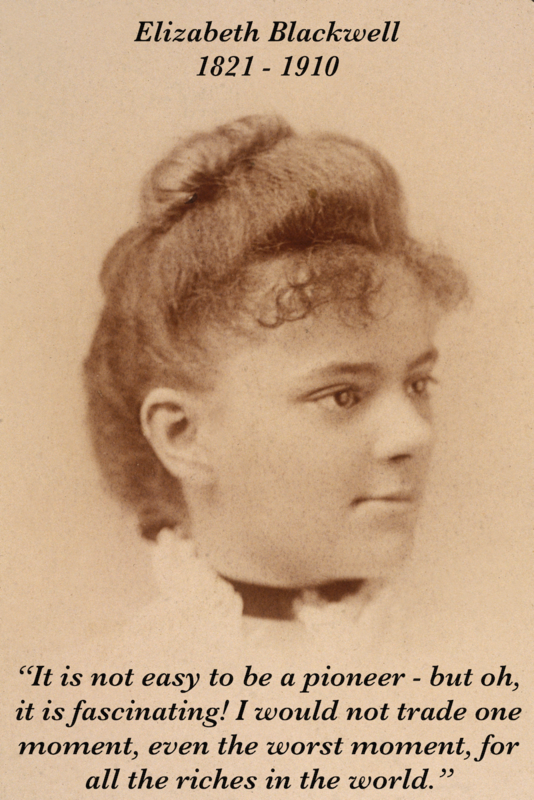 Here’s the thing: Elizabeth Blackwell graduated in 1849, becoming the first female doctor in the United States. Her path was not an easy one. She was told what she wanted was impossible, unless she disguised herself as a male. She was rejected by multiple medical schools simply because of her gender. Until one, Geneva Medical College, accepted her accidentally–the faculty couldn’t reach a decision regarding her admission, so they put it to a vote of the students who thought it was a joke and therefore voted to let her in. Even after Elizabeth had a medical degree, people thought she couldn’t possibly be as talented as a male doctor. But she kept studying, kept learning and healing wherever she could. And in doing so, she changed society. Bridget, you live in an extraordinary time, a time where you have the option to become a doctor. Or a professor. Or a pilot. Without disguising yourself as a male. When you’re old enough, you can own property and vote and be elected to a political office. Your potential is limitless because women like Elizabeth Blackwell fought against gender prejudice to show society females are just as intelligent and hard-working as their male peers. That potential can be overwhelming sometimes. You have so many options, it’s exhausting to filter through them. Believe me, I know. I’ve been down more career paths than most and it wasn’t until I was partway down them that I realized they weren’t right. So take your time. Don’t let anyone force you into making an important decision when you’re not absolutely sure. But when you do figure it out, when you identify the path that thrills you and consumes you and makes you feel like it is the reason you’re in this world, pursue it with your whole soul. Don’t let any obstacles stand in your way or any disappointments dissuade you. Elizabeth didn’t. She accomplished what so many had told her was simply impossible. May you find strength in her example, Bridget. May you never accept people’s opinions about your potential as fact. And when you find a locked door blocking your way, kick it down. Maybe the door you break down will provide following generations with new opportunities. Or maybe it’ll be just for you. What matters is that you don’t let obstacles stop you, even when your dreams seem impossible.